An aerial photograph of Longhurst and Knight's Stream Park, new housing developments in Halswell. 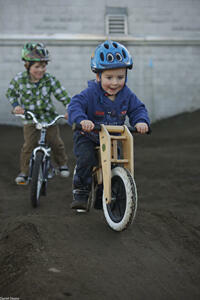 Labels have been added to the photograph by BeckerFraserPhotos. 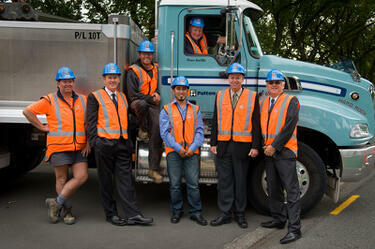 Men in Fulton Hogan vests and hard hats photographed beside a truck, as part of the opening of the Stronger Christchurch Infrastructure Rebuild Team (SCIRT). 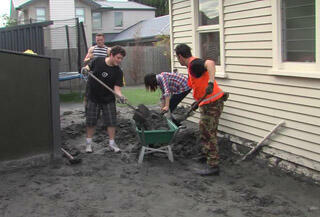 A video about the Reserve Force personnel assisting in Christchurch after the 22 February 2011. 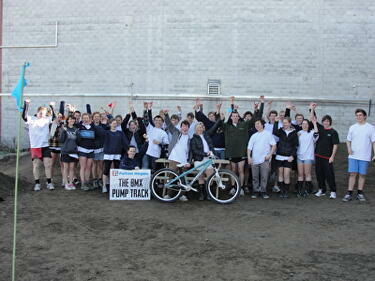 The Reserve Force helped Fulton Hogan clean up sections and streets in Avonside, as well as manning the cordons. 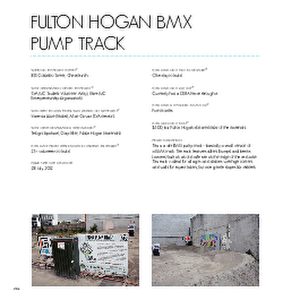 A photograph of a sign describing the Fulton Hogan BMX Pump Track. 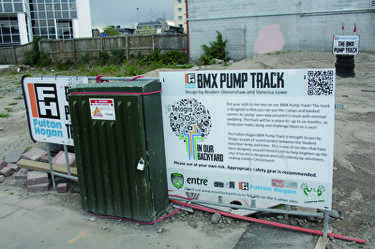 A photograph of a mural on a wall in the former site of a building on Norwich Quay in Lyttelton. Sections of reinforcing steel and other construction material have been laid up against the mural. 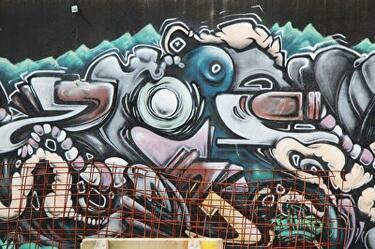 A photograph of a mural on a wall in the former site of a building on Norwich Quay in Lyttelton. 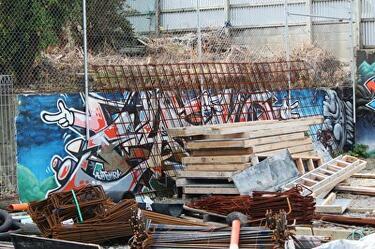 A skip, several pallets, and other construction material have been placed in front of the mural. 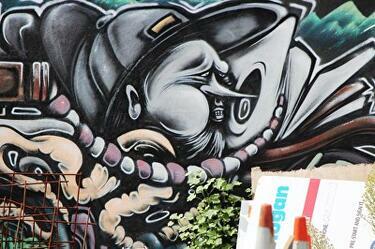 A photograph of a mural on a wall in the former site of a building on Norwich Quay in Lyttelton. Sections of reinforcing steel have been laid up against the mural. 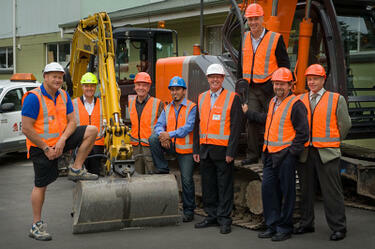 Men in Fulton Hogan vests and hard hats photographed beside an excavator, as part of the opening of the Stronger Christchurch Infrastructure Rebuild Team (SCIRT). 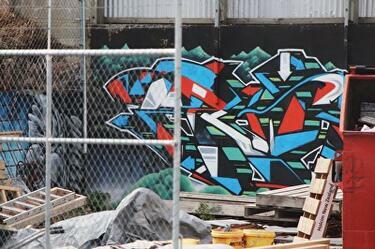 A photograph of a mural on a wall in the former site of a building on Norwich Quay in Lyttelton. 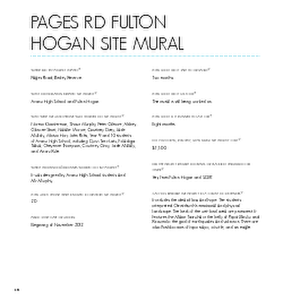 There is a portacom on the site, and construction material is leaning against the mural. 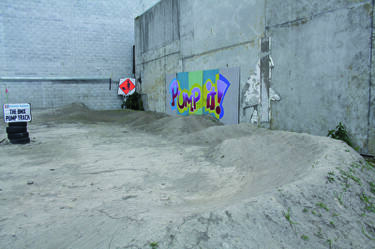 A photograph of a mural on a wall in the former site of a building on Norwich Quay in Lyttelton. 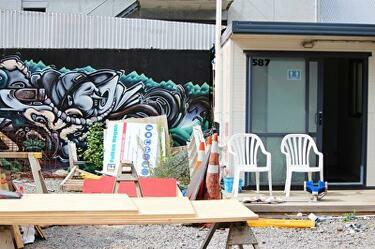 Construction material has been laid up against the mural. 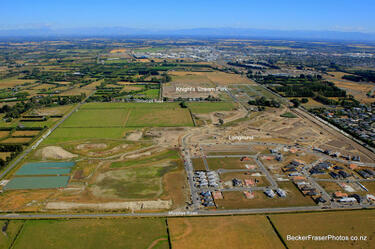 An aerial photograph of Longhurst and Knight's Stream Park, new housing developments in Halswell.